Travel back to the Renaissance era with Da Vinci Diamonds Dual Play Slot at Moon Games! Created by IGT, it is made up of 2 sets of Tumbling Reels along with 40 paylines. It is packed with special features which add novelty to your gameplay. Get the chance to learn more about Leonardo Da Vinci, a famous Renaissance artist and admire beautiful gems on the reels. The different symbols you can find are the Da Vinci Diamonds Logo, Mona Lisa, Lady with an Emine, Portrait of a Musician, Red Gem, Green Gem and Yellow Gem. Enjoy this exceptional slot on any device at Moon Games! 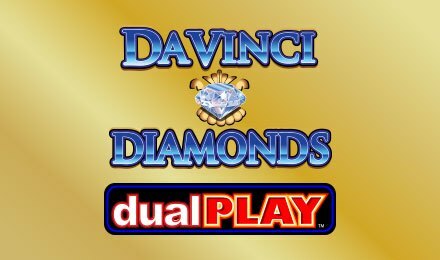 Your game on Da Vinci Diamonds Dual Play Slot starts when you select one of the values on the Line Bet display. When you have set your preferences, click on the Spin button to enjoy the game. The symbols then tumble from above instead of spinning. With the Auto Spin tab, you can launch 10, 20, 30, 40 and 50 automated spins played non-stop. Amount of Paylines Selection: All 40 paylines are fixed and cannot be adjusted. Coin Values: The line bets are as follows: 1.00, 2.00, 3.00, 5.00, 10.00, 20.00 and 25.00 credits. Da Vinci Diamonds Dual Play Slot consists of the Tumbling Reels Feature which is triggered by any winning combination. It is a rewarding feature during which the symbols participating in a winning combo vanish to make space for others falling from above. This creates chances of landing more winning combinations. In addition to this, the Tumble Thru Feature is also available. With this feature, symbols tumble from the top to replace unused ones on the bottom reels. The Wild icon substitutes for any other symbols apart from Extra Paylines Bonus. Land 3 or more Extra Paylines Bonus symbols on reels 1, 2 and 3 to enjoy the Free Spins Bonus round on Da Vinci Diamonds Dual Play Slot. You are awarded 6 free spins and 20 more paylines are added. In this way, you can play with 60 paylines. Every time 3 Extra Paylines Bonus symbols land on reels 1, 2 and 3 during the feature, 6 extra free spins are awarded. You can retrigger up to 300 spins! Enjoy Da Vinci Diamonds Dual Play Slot at Moon Games where lots of fantastic slots are awaiting you. Best of luck!